rebecca likes nails: bundle monster contest! Hey guys, as a lot of you might already know, Bundle Monster is having a nail art contest where 25 lucky girls are going to win their new set of 25 stamping plates! I entered my submission today, and I figured I would do a post about it now! I redid nails you have seen before, but they were on short nails and it was a crappy picture. And my technique wasn't so good! I love these nails so much, and they use Bundle Monster plate bm16, so they were the perfect entry! I used a cosmetic sponge to make the gradient, and a thick coat of Seche Vite to make it all even better! I was a little weary of entering because you're not allowed to use a watermark, I really hope no one tries to steal my photo! The voting starts on the 10th I believe, I hope all you lovely people will vote for me! I'll be sure to post a link when the time comes. 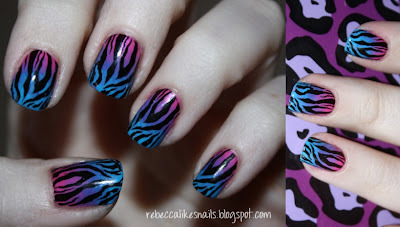 I just can't get enough of animal prints and bright colors lately! I love this. If I had facebook you'd definitely get my vote! Love the gradient! Wow!! They came out so well!! Colours you chose rock! Excellent technique! Good luck! Gorgeous colors together! Your contestants you should look out for you, because this mani looks truly amazing.